When you come across a website Home Page, what is your immediate reaction? 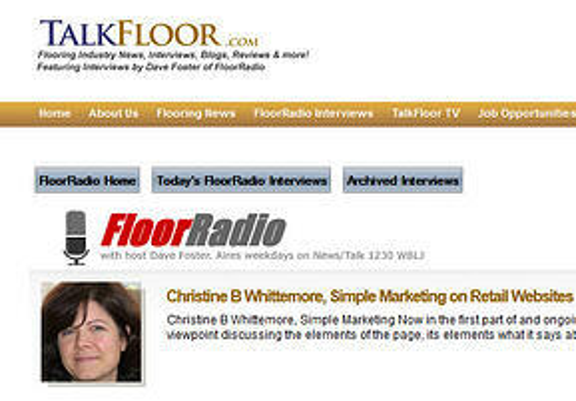 In part 3 of my interview series with TalkFloor's Dave Foster about website evaluations, we explore flooring retailer Home Pages and focus specifically on seven. Part 1 started the discussion about evaluating retailer websites from a consumer's perspective. Part 2 of Evaluating Websites on TalkFloor: Part 2 explored common retailer mistakes. By the way, this radio interview segment is 15:20 minutes long and can be accessed by clicking on this link to TalkFloor's FloorRadio for Part 3. What is the purpose of a website Home Page? It communicates what a business is about to a first time visitor. It does so succinctly, without confusing or overwhelming. It provides answers to questions a visitor has about your product or category. It focuses on real and meaningful content and information rather than superficialities. It directs a visitor to other parts of your website for more information. Recommendation: go visit your own website, look at it as a customer might. What do you notice? I looked at 7 flooring retailer websites. Based on each's Home Page, I detailed what I believed each's value proposition to be. Columbus Flooring & More: large selection of flooring. The Home Page includes lots of good information, and calls to action [e.g., How To information, see showroom, product mages]. Big Bob's Outlet: good value and service. Effective site for organization with lots of information presented in a clean format. Great Floors: design + floor value [supported by beautiful physical store]. The layout is similar to that of Big Bob's. Clean and organized format. Do you agree? What is your assessment of these Home Pages? As you examine website home pages with a fresh set of eyes, think about how you welcome visitors and what you communicate to them. How does your home page help you accomplish that? What website home pages have you come across that you find effective? Let me know in the comments.